The trickiest thing about American Gods, the novel, is that it is not a straightforward novel with a straightforward plot. It is a big, odd, meandering novel that trips through time and viewpoints and dream sequences. It’s a novel that’s one part mystery, one part horror, one part romance (in several strange ways), one part fantasy, one part mythology, and I have no idea how many parts actually make up the recipe of this book, but I know that it’s delicious and that this metaphor got really weird. I don’t eat books, by the way. 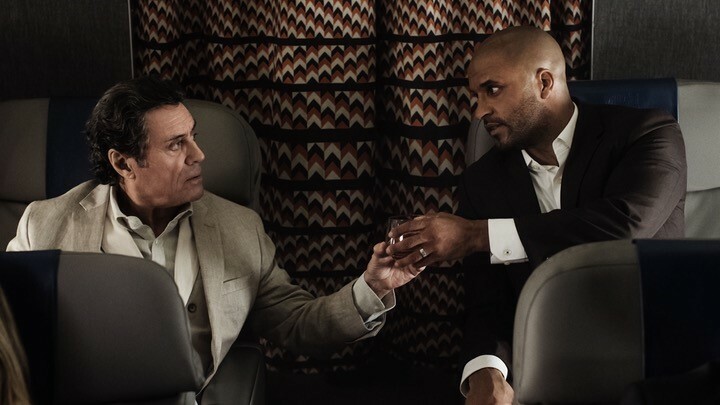 American Gods is a confusing, magical reflection on the confusing, sometimes magical country of America, which is all mixed up with a tangle of cultures and mythologies and opposing viewpoints that create something oddly precarious — and that precariousness, too, is reflected in the novel. This book was never an action-packed page-turner full of twists and gunfights and explosions. It’s a story that creeps along the edges, rolling out slowly like a fog and — if you allow it to do so — seeps into your mind and takes root. The word I always use to describe it is “atmospheric,” which is both accurate and inaccurate, since the book might be a slowly rolling fog, but it also has murderous gods, and the undead. So yeah, it’s not just some plotless thinkpiece, either. That atmosphere thing is critical to me, though. I know that the television show American Gods can’t be identical to the book American Gods (side note: no show can be identical to the book, no show will ever be identical to the book, and setting your hopes for a show to be “identical to the book” is just setting yourself up for disappointment). But to me, as a devoted fan of this big, odd, meandering story, the most important thing for the show to capture and replicate is not exact details of the big, odd, meandering story itself — but the atmosphere that boils up when all those big, odd, meandering ingredients get together and create something fantastic. The story of American Gods begins with a tale of Vikings arriving in the Americas, as narrated by Mr. Ibis (who, I assume, will probably be narrating all the flashbacks we see in the series). The travelers left their homes to seek out riches in a new land, but find only hostility, starvation, and misery as soon as they step foot on foreign soil. Desperate to return home but lacking the wind to sail away, they maim themselves in the name of their god by each stabbing out an eye, then they sacrifice one of their number in the name of their god by burning the man alive. And, finally, they realize that the one they worship is a war god. So they start a war. Their methods of worship are bloody and brutal, but effective — the god they were praying to evidently grants them a sailing wind that will send them back home. But when they leave, they leave the god tied to the land, waiting. Mr. Ibis’s narrative establishes the main premise of the series, which is that the manifestation and power of the gods rests solely on whether or not people believe in them, remember them, and worship them. Now in the story of present-day America, a man named Shadow Moon is in the last days of a three-year prison sentence. In his waking hours, Shadow has a feeling that something big and menacing is coming for him — something he can’t see, but can’t help believing in. When he sleeps, he dreams of an orchard of bones beneath a starry sky and a noose hanging from bone-white branches. It’s evident that Shadow’s life is teetering on a precipice of change, and when he gets news that he’s to be released early because his wife, Laura, has died in a car accident — well, there is really no way that whatever’s coming is going to be good for him. After a brief flashback while Shadow’s standing in the airport, waiting to get on a plane and go back to his hometown for his wife’s funeral, we get the introduction of Mr. Wednesday. Everything about Mr. Wednesday screams “con-artist,” from the smooth way he finagles a seat in first class to the cryptic references he makes to Shadow, to his bizarre theory that the plane he and Shadow are sitting in owes its flight not so much to physics, but to people’s belief in the plane’s ability to fly. So when Mr. Wednesday offers Shadow a job, I’m sure everything within Shadow is screaming at him to reject it. Which he does. Unfortunately for Shadow, he’s the protagonist of this show and he doesn’t really have a choice in whether or not he participates. Shadow falls asleep on the plane and dreams again, but not just of the Bone Orchard from before. In a captivating and incredibly surreal scene, Shadow dreams of a massive buffalo with flaming eyes. “Believe,” says the Buffalo. When Shadow wakes, Mr. Wednesday is gone — but not gone for good. After getting a car, Shadow drives, alone, to his next destination. He pauses for a moment to scream at the sky, which I don’t begrudge him. His life just turned very rough and, sadly, it’s only going to get rougher. After this moment of anger at the (ha!) gods, Shadow stops at a truly ridiculous place called “Jack’s Crocodile Bar” (the bar is literally in the mouth of a giant fiberglass crocodile) for food. While there, Shadow runs into mysterious Mr. Wednesday and gets the job offer again. After informing Shadow that the job waiting for him back home no longer exists — Shadow’s wife and his best friend (Robbie), who had lined the job up for him, are both quite dead — Shadow is tricked into working for Mr. Wednesday via a coin toss. The scenes in Jack’s Crocodile Bar are absolutely wonderful, from the set of the bar itself to the introduction of Mad Sweeney the Seven-Foot-Tall Leprechaun to the character and story elements it establishes. Mr. Wednesday fast-talks his way through a lot of expectations for Shadow Moon before Shadow signs on as his “aide-de-camp [and] castellan” through the ritualistic drinking of mead. Not only is Shadow to be Mr. Wednesday’s all-around assistant, but also essentially his bodyguard. Shadow is also the one who, in the event of Mr. Wednesday’s death, is expected to hold his vigil. Ricky Whittle plays Shadow as impatient, angry, and skeptical enough — not to mention distracted by Mad Sweeney’s perfect darts game going on in the background — that it’s unclear whether Shadow is even listening to what Wednesday is saying. This depiction, as well as the other bursts of anger and emotion throughout the episode, is a departure from the almost preternaturally cool and collected Shadow of the novel, but it still manages to be perfect. Mad Sweeney challenges Shadow to a fight out of nowhere and, reluctantly, Shadows fights him. Sweeney promises gold that he pulls from who-knows-where and basically just lives up to his name, madly ranting about fighting for the joy of fighting and laughing when Shadow pummels him bloody. The fight ends with a cut to black for the audience, but Shadow wakes in the back of a Cadillac, with Mr. Wednesday driving, and seems to have won — though he can’t remember doing so. Mad Sweeney had even taught him the coin trick that involved pulling gold from nowhere and gave Shadow a shiny gold coin as a prize. At Laura’s funeral, Shadow learns from Robbie’s widow, Audrey, that Robbie and Laura dying on the same day wasn’t just some weird coincidence. The two were having an affair, and died in the car accident together. When the funeral is over, Shadow throws the gold coin he received from Mad Sweeney on Laura’s grave and spends a few moments shouting at her, telling her that he read books in prison and he wanted to surprise her with what he’d learned. It’s genuinely such a good performance by Ricky Whittle, and another example of how show-Shadow’s emotional turmoil is much more clear than book-Shadow’s. The performance of a half-mourning, half-furious, all-drunk Audrey (played by Betty Gilpin) that follows Shadow’s rant to his dead wife is also pretty great — great enough to distract Shadow from seeing the coin he’d dropped on Laura’s grave getting sucked into the soil. There’s just one more meeting Shadow must suffer through before he’s allowed to return to... whatever life he’s about to have as Mr. Wednesday’s employee, and that meeting is with a boy in a limo. As the scrawny, strange hipster across from Shadow vapes on toad skins (what?) and occasionally tells his faceless robot henchmen to punch Shadow in the face, he rants about how Wednesday is old and Shadow will be deleted. It’s a visually trippy scene, full of smoke and the implication that Shadow probably thinks he’s hallucinating when the world around him digitizes, then he goes flying up into the sky. He lands in the mud and rain, the faceless henchmen beating him and eventually stringing him up to a tree with the noose that had haunted his Bone Orchard dreams. Before Shadow chokes to death, the rope around his neck is cut and the rain and mud has mixed with the blood of his attackers, who have been very, very killed by some unknown and unseen force. And that’s it for the pilot of American Gods! Personally speaking, I think “The Bone Orchard” delivers the atmospheric requirements I was hoping for in an American Gods adaptation, while also sprinkling in some of its own flavor and character interpretations. It’s visually captivating, superbly acted, and I am so looking forward to more. I think the only iffy aesthetics of the show might be the non-scenery CGI, like the trees and the noose in the Bone Orchard in Shadow’s dream. Everything else looks amazing. “I’ve got an eye for these things. Just the one.” Hee. I love that the show recognizes the “road trip novel” aspects of the story by giving us a few very nice driving scenes, with large vista shots of the American landscape. Yes, I skipped talking about The Scene with Bilquis in the main review. I try to keep something of a narrative flow with my reviews, and the Bilquis cut-away didn’t quite fit. All I really have to say is this: The “holy moly, what? !” factor does not diminish in the book-to-screen translation. Fuller is falling off a commended keep running on NBC's Hannibal, an exceptionally in vogue, mentally complex adjustment of the Hannibal Lecter books, and American Gods is an open door for him to keep investigating darker narrating while at the same time consolidating the eccentric components of his prior TV arrangement, for example, Pushing Daisies.